A commanding presence among your home furnishings, this traditional six-drawer chest offers a host of versatile storage options and breathtaking details. 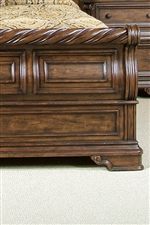 Crafted from poplar solids and birch veneers with a rich Brownstone finish, this chest showcases intricate shaped pilasters, rope twist mouldings, and scrolled bracket feet. All drawers feature English dovetail construction and full extension metal guides, while the top drawer is lined in felt to protect delicate jewelry and accessories. 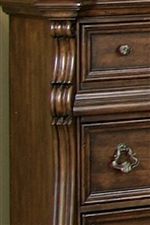 Ornate burnished brass drop-rings and burnished brass knobs adorn the drawer fronts, contributing additional visual interest. 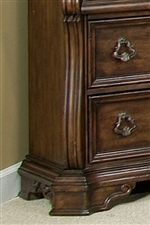 An essential storage piece, this chest contributes ample function and style to your living space. 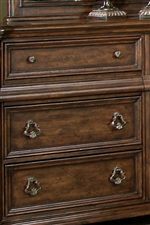 The Arbor Place 6 Drawer Chest with Ornate Moulding and Burnished Brass Hardware by Liberty Furniture at Novello Home Furnishings in the Berlin, Barre, Montpelier, VT area. Product availability may vary. Contact us for the most current availability on this product. 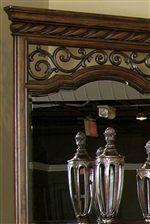 The Arbor Place collection is a great option if you are looking for furniture in the Berlin, Barre, Montpelier, VT area. Browse other items in the Arbor Place collection from Novello Home Furnishings in the Berlin, Barre, Montpelier, VT area.